A chance trip to Macy's Department store set one area father on a mission. A few years ago, Steve Morton's son Tyler was the Make-A-Wish Foundation of Middle Tennessee's child of the month for December. So they traveled to the Cool Springs department store and witnessed the Macy's "Believe" campaign. The store invites kids to believe by dropping off a letter for Santa at a local Macy's Santa Mail letterbox. For each letter dropped off in a Santa Mail letterbox through Christmas Eve, Macy's will donate $1 to Make-A-Wish, up to $1 million, to help grant wishes for children who have life-threatening diseases. And Macy's pledged to donate $2 for every letter dropped in the letterbox on a specific day. "We went to Macy's, and I saw all the letters. I thought I could do this," Steve Morton said. Morton was determined to help both children with life-threatening diseases and Make-A-Wish of Middle Tennessee because of his son's connection to both. In 2006 when Tyler Morton was 10 years old, he diagnosed with recurrent respiratory papillomatosis (RRP), which is a rare medical condition that causes tumors to grow on his vocal cords. This rare condition only affects 4.5 out of every 100,000 children and could prove fatal if the growths aren't removed because they can block Tyler's airway. Tyler's tumors grow so fast, he has to have them removed every three months. "He has anywhere between a 20-70 percent blockage everytime," Steve explained, adding Tyler has had 22 surgeries in the past six years at the Monroe Carell Jr. Children's Hospital at Vanderbilt. Not knowing if Tyler will ever recover fully from RRP, he applied for a wish and Make-A-Wish granted it. Steve credited the Make-A-Wish Foundation of Middle Tennessee for giving his son and the entire family something to anticipate other than another trip to Vanderbilt when it granted Tyler's wish for a Carribean cruise. "It was really a blessing for us because it gave him and us something to look forward to other than another surgery," Steve said. Tyler explained he thought about it for months and researched wish ideas on the Internet before picking a cruise. "I knew I was only going to get one, so I wanted to do the right thing," Tyler said. He said the cruise was his best idea, because he wanted to choose something his whole family could enjoy together. Plus, he got to swim with the dolphins on his birthday. "And I got pretty much unlimited money in the arcade. That was pretty cool," Tyler said. His dad's deciation to the Believe campaign is also pretty cool. Last year alone, Steve collected 15,000 letters from around Middle Tennessee, which raised $30,000 for Make-A-Wish of Middle Tennessee. The foundation serves 38 counties in the midstate and grants between 90-100 wishes every year. With each wish costing $7,000 on average, Steve's dedication helped four sick kids have their wishes granted. "This is one of (Make-A-Wishes') biggest fundraisers," he said. "All that money comes straight back to Middle Tennessee kids." His goal this year is to collect 20,000 letters to Santa by going to schools, churches and just about any event he can to drum up support. 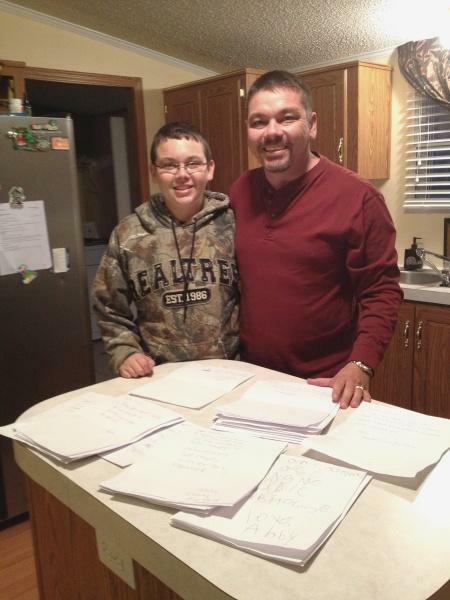 "I went to a wrestling match in Columbia and got 50 letters that night," the determined dad said. Anyone one or group that is interested in contributing letters can call Steve Morton at 615-513-6027 or e-mail him at steve.morton08@concast.net. He will pick up any letters by Dec. 10 and turn them in to Macy's department store on the $2 day. He noted the letters do not have to be in envelops. He said his determination comes from having a sick child, which puts life into prespective. "I've lived in Middle Tennessee all my life and never been to the children's hospital before. It's life changing," Steve said, adding he wants to help sick children and their families like Make-A-Wish helped his. "We've been through a lot. But we try to stay positive, because it could be a lot worse," Steve said about the family's experience with Tyler's disease. "We still come home with our child when others don't." Masiongales has been doing this for the past 2 years. If you would like, you can drop your letters to Santa off at Masiongales, 207 W. Main St. (on the square) Woodbury.